It's been quite the eventful day at my house today. We were woken up early by a flood in our basement, which resulted in us pulling up our floors at 8am. It's just been hectic. I decided I needed to pamper myself after this long day, and took off some old polish. 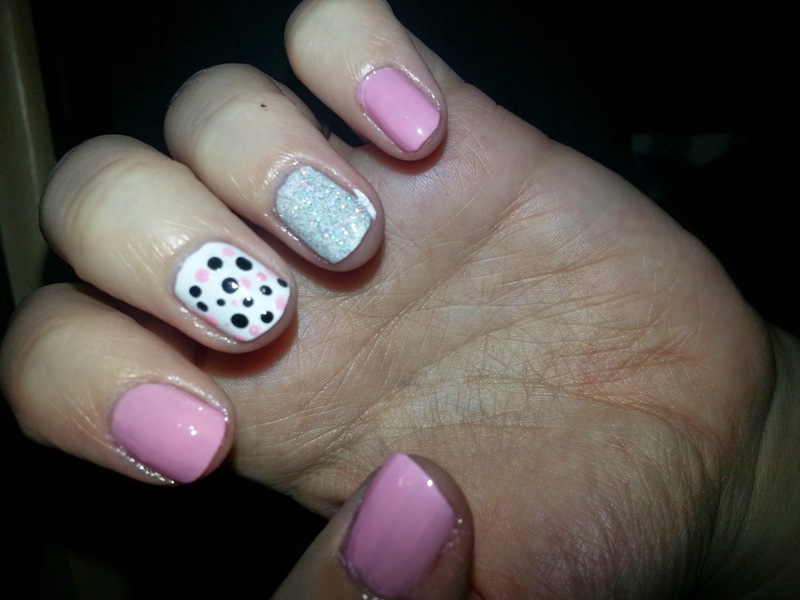 I posted a few months ago that I wanted to start a section on this blog called "Nailed It!"... here I would share some of my "nail art" or just whatever colour of polish I was rocking during the week. Well, I didn't start it up like I wanted to. I decided that I would try and attempt some nail art tonight (if we could call it that) and share what I did, and what products I used. First I applied my base coat, then applied the pink (Color Club - I Believe In Amour) to my thumb, pointer finger and pinky. Next up I applied the white polish to my middle and ring fingers. Letting each coat dry inbetween, I applied another coat of the pink polish, then applied the Celibacy Club (Sephora by OPI mini) onto my ring finger (2 times). 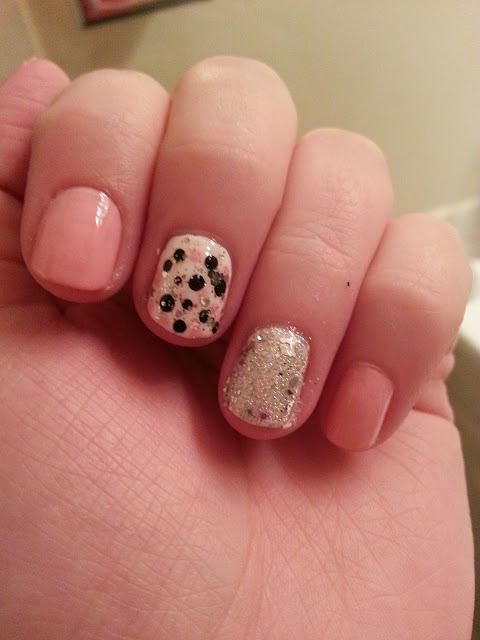 I then used an old bobby pin to apply little dots of the black and pink polish onto my middle finger. I decided I wanted a little more sparkle so I used Essie Lux Effects in Set in Stones on top of both my middle and ring fingers. Once dry I added my top coat. This was a super easy way to start incorporating "nail art" into my polish routine. I have another look in mind for Valentine's Day, so I will get that up for my next "Nailed It!" post! Warming Wednesday! - What's in your warmer?! The Face Shop - Mask Haul! Ipsy - February 2015 - Sneak Peeks!